In keeping with the spirit of giving, I decided it was time that I got busy making something special for YOU, my followers and friends. On my Christmas blog you will now find a new page in the menu called Downloads. 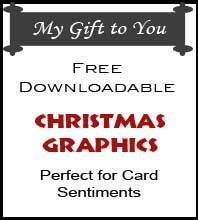 There you will find several free Christmas graphics that you can download and use on your Christmas cards and projects. I really hope you will take advantage of this opportunity, as I have spent a lot of time creating these little gems. Oh yes, did I mention they are FREE? I will be making more graphics as I am able to find time. I have SO many festive ideas running around in my head! Lots more surprises are on the way to my Christmas blog so you will want to check back often. While you are visiting It's All About Christmas, I would love it if you'd leave me a comment. And now, let's see what you can do with this first batch of Christmas graphics! I would like to find out more information on your sleigh ride card posted here: http://main.cricut.com/community/Cricut-Community_postst37013_Sleigh-Ride---Framed-Card.aspx. I couldn't find an email to email you my request. I'm new to cricut so would appreciate any and all help you can give.